Perdido Towers is far from the crowds, located on brilliant white beaches, nestled between blue-green waters of the Gulf of Mexico and the peaceful solitude of Old River. There are 500 feet of beachfront to enjoy from your balcony or beach. Keypad entry to the buildings provides security and units have a private or semi-private entry from the elevators. 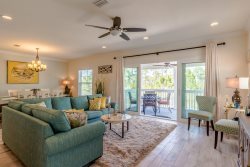 This unique condominium offers 7 unique floor plans and two or three bedroom units. Floor-to-ceiling windows provide unbelievable beach views and lots of sunlight. Boat docks and boat launch on Old River are a bonus for fishermen and boaters. Perdido Towers is located on the West end of Perdido Key just one mile east of the FL-AL state line.